In the image below I combined together a riding pose at the bottom and an archery pose at the top. By combining these two poses together, I was able to create a more unique render, without too much effort. Doing so will also allow us to significantly expand our pose repertoire, simply by just using our existing poses in new ways. Composed pose for Olympia figure – riding pose and archery pose. Rendered in Daz Studio 4.6 Pro with simple distant and UE2 lights. Post-work in Photoshop. Selecting the pelvis and all of its children. I first applied a horse riding pose. Next, I placed her properly on top of the tiger. 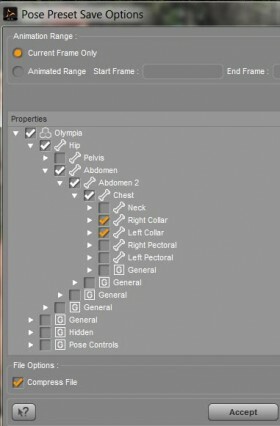 Then, I open up my figure (Olympia 6) node in the Scene panel. I select the Pelvis section, right click, and choose the Select All Children option (see right). This selects the pelvis, right and left thighs, all the way down to the feet. 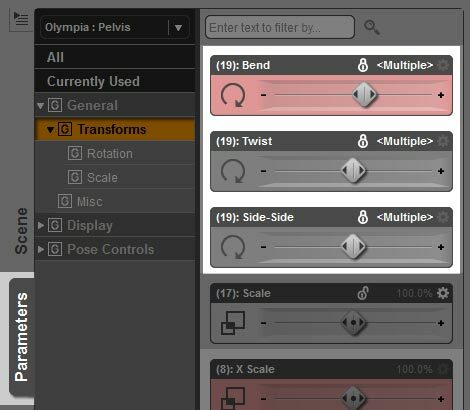 After making the selection, I open the Parameters tab and lock the values for Bend, Twist, and Side to Side. This locks my figure pose from pelvis downwards (see below). After making the selection, I open the Parameters tab and lock the values for Bend, Twist, and Side to Side. Now, when I apply poses to my figure, only her upper body will be affected. I am now free to try out various archery poses until I find one that fits. Some tweaks may be necessary to make the resulting pose look natural. Finally, I get a cool and unique pose of an archer girl riding a tiger. Below, I use the same process to create a sword wielding warrior girl, riding on a Siberian Tiger, while battling a fierce dragon. Rendered in Daz Studio 4.6 Pro with Distant Lights and the UE2 light. Post-work in Photoshop. Right-click on the root of a figure, and choose Select Children. Go to the Parameters tab and select the Transform option. Lock the values for Bend, Twist, and Side to Side, similar to what we did before. This will lock the pose of the entire figure. Finally, we select the section of the figure we want to alter (e.g. right arm). 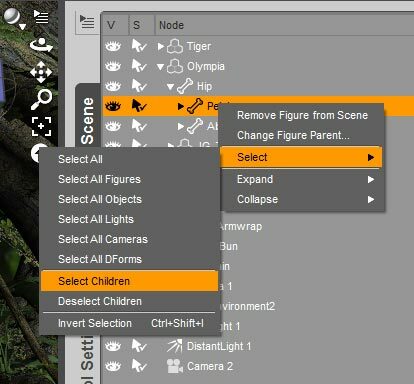 Right-click and choose Select Children. Unlock the values for Bend, Twist, and Side to Side. When we apply a new pose, it should only affect the right arm of our figure. For example, in the One Sweet Song image below, I used this process to pose my summer girl’s arms so that she is properly holding the cello. Rendered in Daz Studio 4.6 Pro, with post-work in Photoshop. This image also uses the Look at My Hair free player. Suppose I just want to zero out an arm all the way down to the fingers. Right-click on the target arm, and choose Select Children. 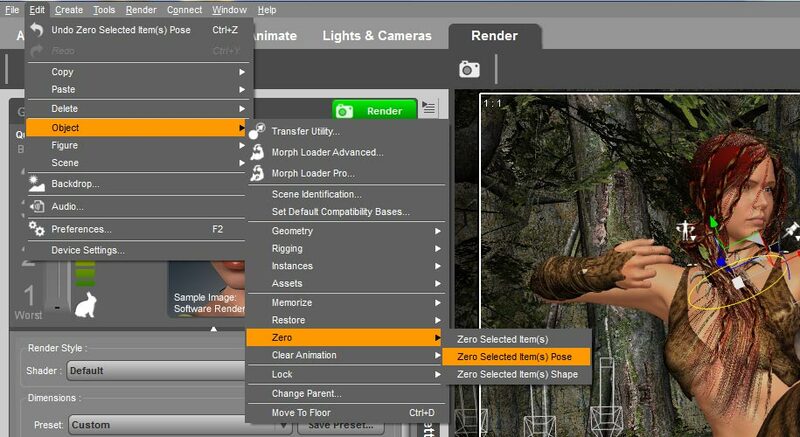 Go to the Edit menu at the top of the Daz Studio interface. Then select Object >> Zero >> Zero Selected Item(s) Pose. We can save partial poses by drilling down on our selected figure, and just picking the parts that we want to save. For example, suppose I just want to save the bow-grip pose of my figure. 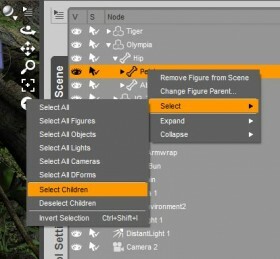 I would select the target parent figure in my scene. I go to File >> Save As >> Pose Preset. How to save a partial pose. I type in my pose present filename. How to only save the arm bow-grip pose of my Olympia figure. After this, I get a pop-up menu titled Pose Preset Save Options. I deselect Olympia, and then drill down on the figure until I get to the parts I want to save. In this case, I only want to save the pose of both arms so I select Right Collar and Left Collar. 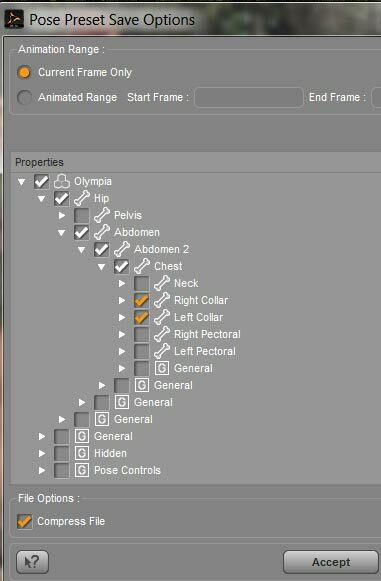 Once I am done selecting the parts of my figure I want to save in my pose present, I click on the Accept button. This saves out a partial pose. Finally, below is another combined pose with a girl riding on a dragon, and waving goodbye before she takes off. 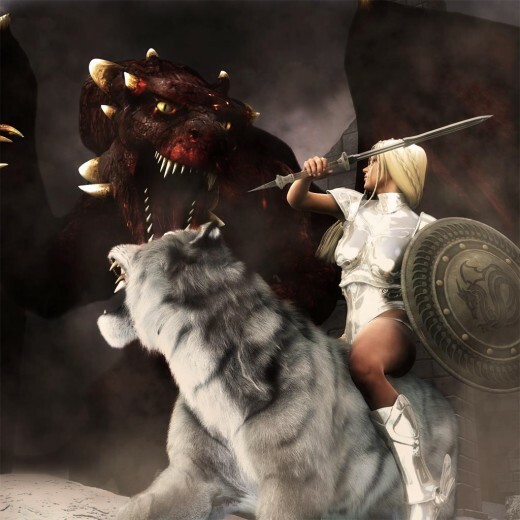 Girl Riding on a Dragon. Rendered in Daz Studio 4.6 Pro, Post-work in Photoshop. Another great tutorial. I’m still learning! I have a pose I love, but the arms are not what I need, this is great. Wow – whenever I read your articles it’s like light bulbs go on over my head. I always learn something new! I can’t believe I have been using DAZ since 2007 and never knew how to lock parts of a pose! I have always used stock poses and then spent hours manually tweaking the bit I want to be different. This is great news! Thank you, thank you, thank you! Hi, I’ve read your different papers above and will keep them somewhere for future use. May be you can help me in solving the following problem. When I want to animate M4 or M5 with DAZ3d 4.8 while the character walks his feet keep staying at a 45° angle which makes him appear to walk on his heels which is ridiculous! I tried to correct the feet’s position but as soon as the animation begins the feet resume their awkward position. Any idea how I could fix that. I’m a beginner as far as DAz is concerned. Thanks in advance. Claude from Paris-France. Hello Claude, so sorry for the late reply. I am afraid I do not do animation on Daz Studio so I do not have experience in this area. 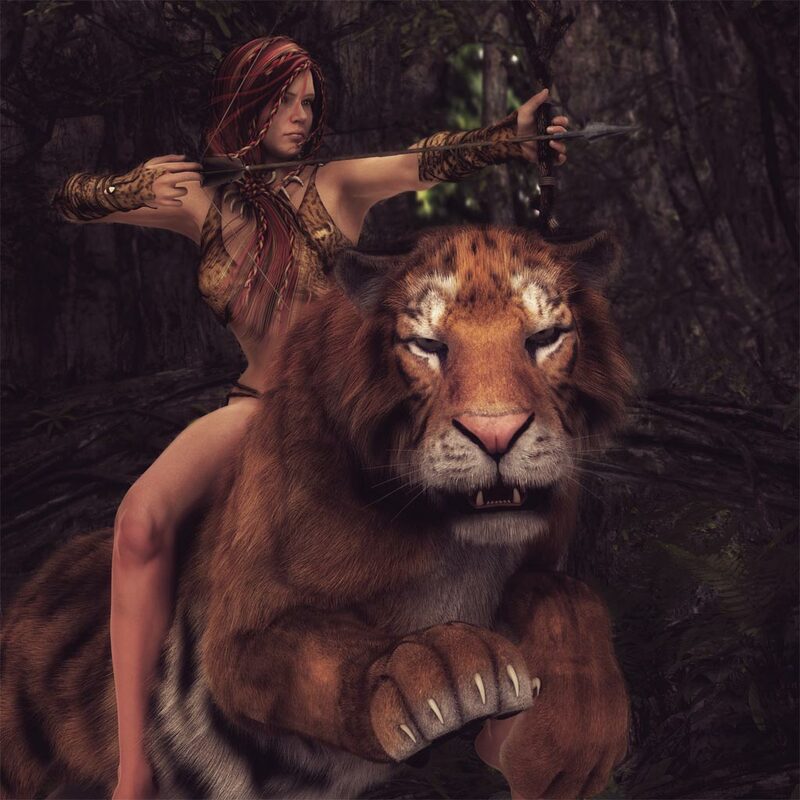 Have you tried posting in the Daz3D forum? There are usually many helpful people over there. I love your tips and tricks, they are great for us new DAZers lol keep them coming! Great idea to lock the bones partially before posing! Nice article (and great looking site, btw). An interesting way to get fairly dynamic poses from just about any model is use puppeteer. 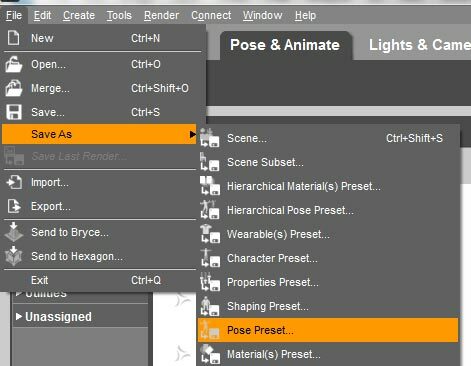 The idea is, you set up a wide range of poses and capture them individually on puppeteer. After that, you use the preview to shift your model through the various poses, saving ones that you like as you described above. I find this useful for a couple of reasons. First, Most poses are designed for a generic model (Genesis 2 Female, Victoria 5, Aiko 4, etc, etc). Having the computer shift to a new pose allows you to see more natural poses for that character. Besides, most preset poses are far to stiff to feel natural. Seeing your model move “loosens” them up a bit and gives you a better idea of yours models qualities. Second, you do this for individual body parts, or the entire model. I love using this technique for expressions and hand gestures. You can also use this to pose hair and clothing, getting props to bend in ways that are hard to do with dials or pose tools.